La Crèche in Merate, Italy have been running their intergenerational summer camp since the beginning of the TOY Project. 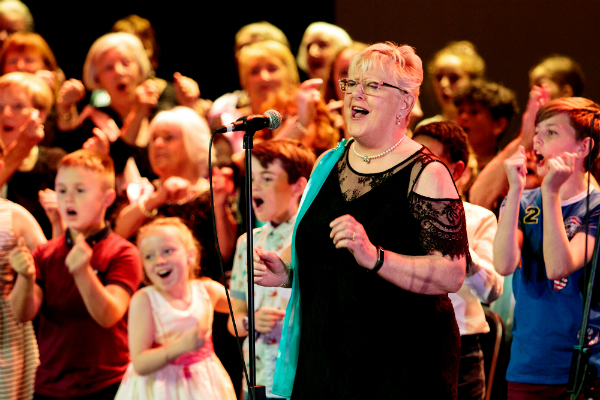 News of this innovative Intergenerational Learning (IGL) initiative has spread far afield. Recently, they hosted a delegation from Japan. 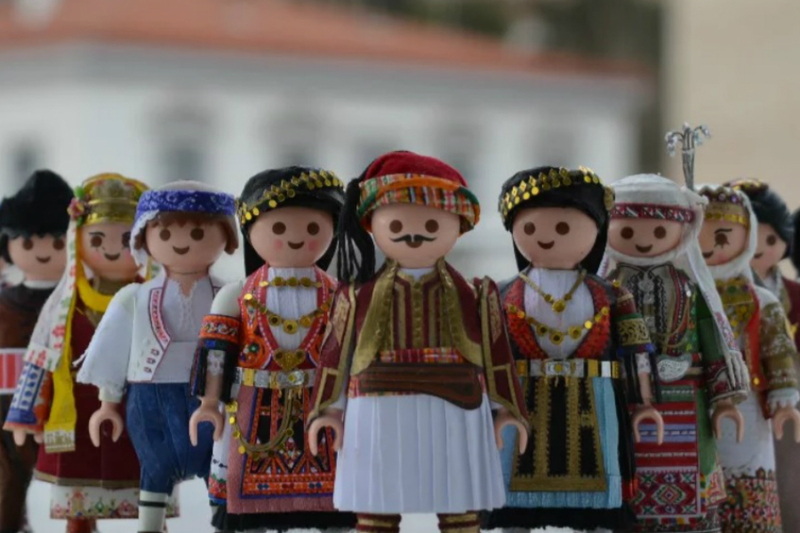 Silvia Porta, from La Crèche, writes about the experience in this blog. Last summer, the Intergenerational Summer Center “Di Segni e di Sogni”, organized by La Crèche in Merate (Italy) welcomed three visitors from Japan eager to learn and exchange experiences. They were: Mr Kazunari Fukuda, manager, and Mrs Miyuki Ii, practitioner, of a care service “Hoshi no Ie” for older people affected by dementia. And Mrs Okuyama Kiyoko, Professor in Human Life Sience at Notre Dame Seishin University. Our guests at La Crèche are having been finding out about different IGL projects as they would like to introduce some innovative IGL approaches to their centres. Currently, they are using the Montessori method with their patients with dementia and have been noticing positive results. Now, they would like to implement new activities based on the IGL approach, and one idea being explored is to set up a multigenerational center. 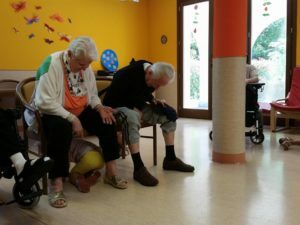 During their visit, they joined the children at Villa dei Cedri, an old people’s home where most of the residents are affected by dementia and Alzheimer’s. They were fascinated by the social theater workshop called, “Per terra il cielo,” which was performed by Anna Fascendini, an actress with the Scarlattine Teatro Troupe. 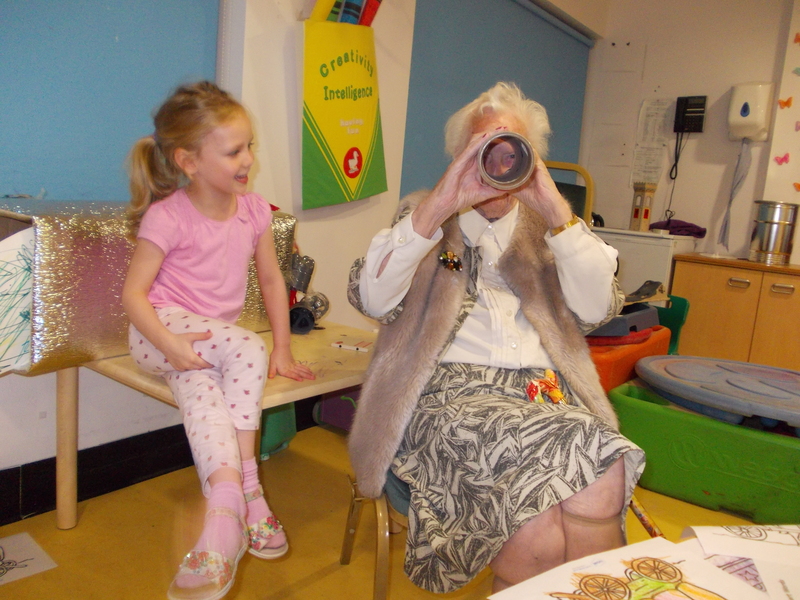 This workshop involved children aged 3 to 5 years and older adults with mild dementia. The theatre helped the adults and children discover an invisible thread which links them, as they were invited to repeat common gestures that are part of both age groups’ daily routine. Such an activity is designed to reduce the gap between two age groups which normally live apart. They were so impressed with this unique approach. A few months later, they replicated it in their daycare center inviting children from a kindergarden. Prof. Okuyama was happy to inform us that it had been a great success. Afterwards, our Japanese guests participated in some Montessori labs with older children, aged 8 to 10 years. We exchanged our ideas about this experience, which gave some new ideas for activities to replicate in their country. 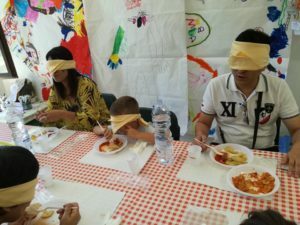 Another interesting moment was the “Blind lunch” for children aged 6 to 7 years. This is based on the idea that children can experience disabling situations in order to learn how to interact in a proper way with older adults who are facing similar difficulties. 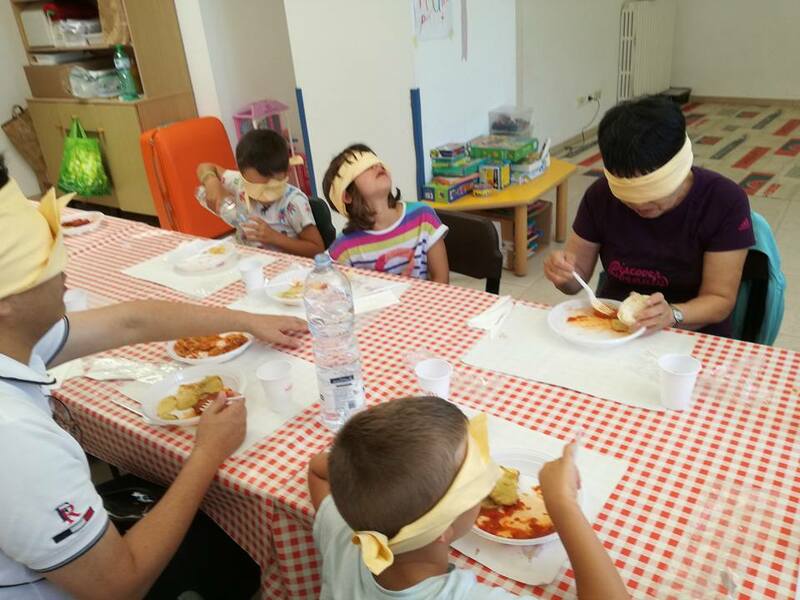 During lunch, the children and the Japanese visitors were blindfolded, and couldn’t see what was served or find the glasses and dishes. The final activity of the day was a dramatic interpretation of the children’s story “We’re going on a bear hunt” by Michael Rosen and Helen Oxenbury, which the children performed for older adults affected by ALS in the Villa dei Cedri. We were sorry that our Japanese visitors didn’t have the opportunity to participate in this magical activity. The children’s passion and energy touched the hearts of all of us. Even if we have a different culture and language, our goal is the same. We are confidant that the collaboration with these new friends from Japan will continue. We experienced a common way of feeling and thinking, a rare and precious gift. Translated by: Ilaria Farina, Retesalute, TOY partner in Italy.